Lectures on the Will to Know reminds us that Michel Foucault's work only ever had one object: truth. Here, he builds on his earlier work, Discipline and Punish, to explore the relationship between tragedy, conflict, and truth-telling. He also explores the different forms of truth-telling, and their relation to power and the law. 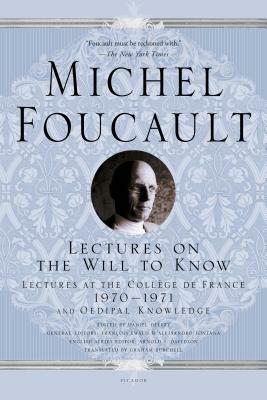 The publication of Lectures on the Will to Know marks a milestone in Foucault's reception, and it will no longer be possible to read him in the same way as before. Michel Foucault (1926-1984) was acknowledged as the preeminent philosopher of France in the 1970s and 1980s, and continues to have enormous impact throughout the world in many disciplines. His books include The Government of Self and Others, The Courage of Truth, The Birth of Biopolitics, and The Punitive Society. Graham Burchell (Translator) is the translator, and has written essays on Michel Foucault. He is an Editor of The Foucault Effect. Arnold I. Davidson (Editor) is the Robert O. Anderson Distinguished Service Professor at the University of Chicago, and Professor of the History of Political Philosophy at the University of Pisa. He is co-editor of the volume Michel Foucault: Philosophie. He lives in Chicago.